In large resealable food-storage plastic bag, place flour, salt and pepper. Add pork; seal bag and shake to coat. In 12-inch skillet, heat oil over medium-high heat. Brown pork cubes in oil on all sides, working in batches if necessary. Spray 3 1/2- to 4-quart slow cooker with cooking spray. With slotted spoon, remove pork from skillet to slow cooker. Stir in all remaining ingredients except rice and water. Cover; cook on Low heat setting 6 to 8 hours. About 25 minutes before pork is done, cook rice in water as directed on package. Serve stew over rice. Using both red and green bell peppers makes for a colorful dish, but you can use 2 red or 2 green if you like. 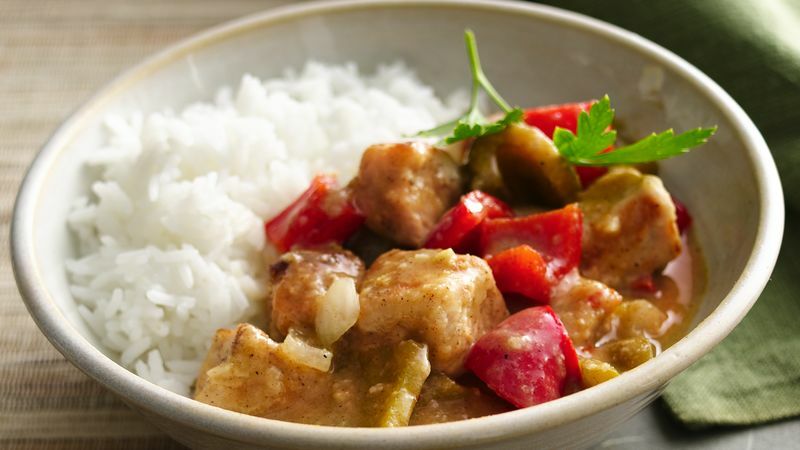 For a change of pace, serve this flavorful stew on a bed of brown rice instead of white rice.